2Agronomy Department, Iowa State University, Ames, USA. practice. 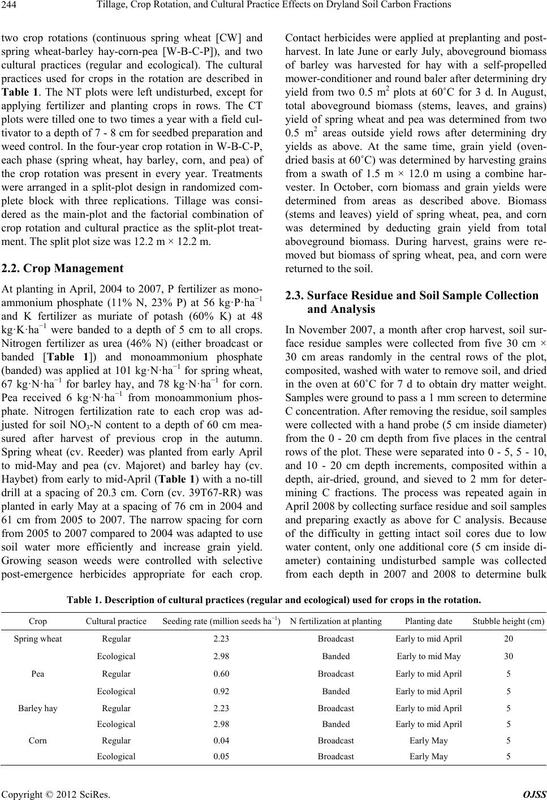 Mineralization reduced surface residue and soil labile C fractions from autumn to spring. economic and environmental sustainability [16,17]. organisms and influences soil aggregation . 100 yr have decreased SOC levels by 30% to 50% [7,24]. dryland surface residue and soil C fractions. ching, surface runoff, volatilization, and denitrification. agement practices from autumn 2007 to spring 2008.
in April 2004 were 8.8 and 21.7 Mg·C·ha−1, respectively. ment. The split plot size was 12.2 m × 12.2 m.
kg·K·ha−1 were banded to a depth of 5 cm to all crops. 67 kg·N·ha−1 for barley hay, and 78 kg·N·ha−1 for corn. sured after harvest of previous crop in the autumn. to mid-May and pea (cv. Majoret) and barley hay (cv. soil water more efficiently and increase grain yield. post-emergence herbicides appropriate for each crop. in the oven at 60˚C for 7 d to obtain dry matter weight. Table 1. 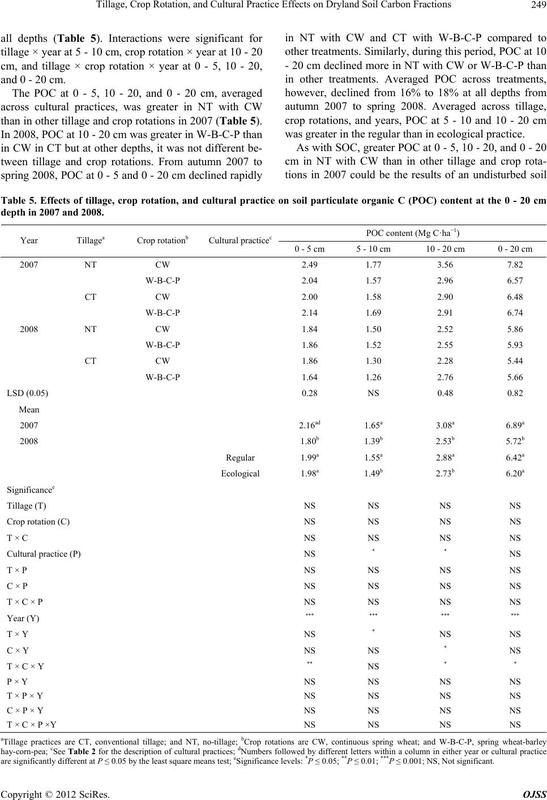 Description of cultural practices (regular and ecological) used for crops in the rotation. summing the contents at 0 - 5, 5 - 10, and 10 - 20 cm. was evaluated at P ≤ 0.05, unless otherwise stated. was greater in 2004 than in other years. tion. This was especially true for spring wheat in CW. age and cultural practice did not influence biomass yield. Table 2. Effect of crop rotation on crop biomass (stems and leaves) returned to the soil from 2004 to 2007. (between crop rotations) are significantly different at P ≤ 0.05 by the least square means test. 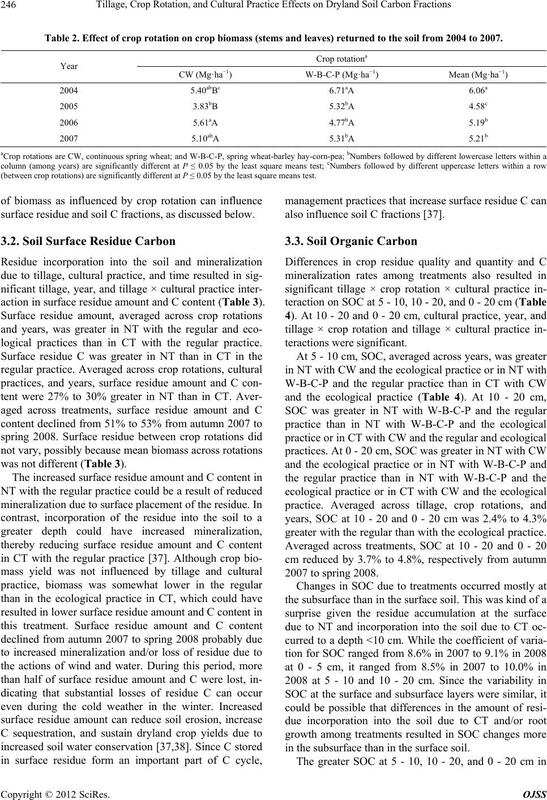 surface residue and soil C fractions, as discussed below. 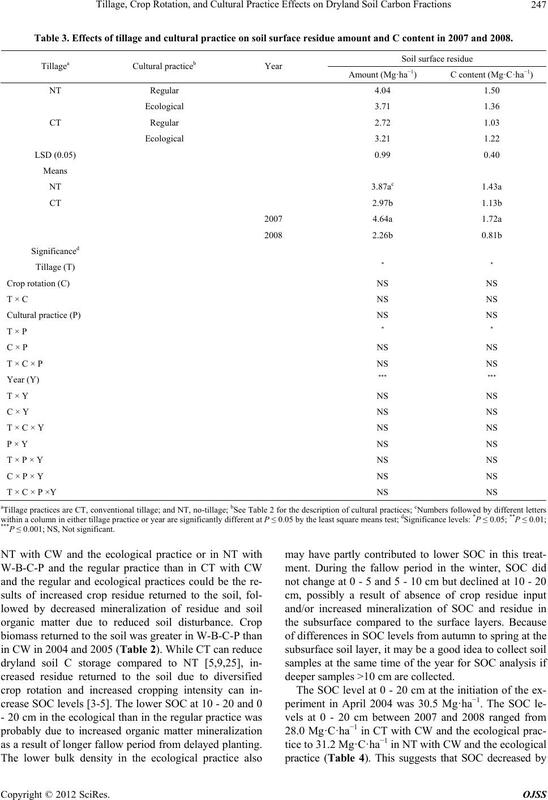 action in surface residue amount and C content (Table 3). logical practices than in CT with the regular practice. was not different (Table 3). also influence soil C fractions . greater with the regular than with the ecological practice. in the subsurface than in the surface soil. Table 3. 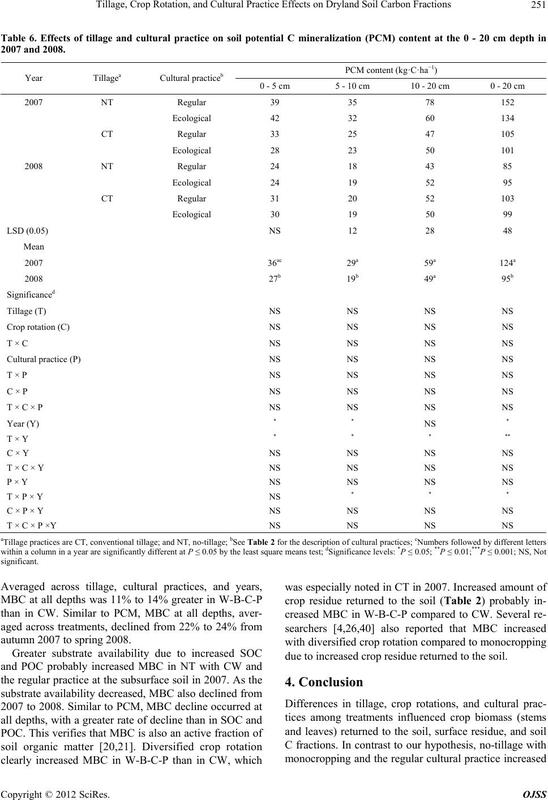 Effects of tillage and cultural practice on soil surface residue amount and C content in 2007 and 2008. 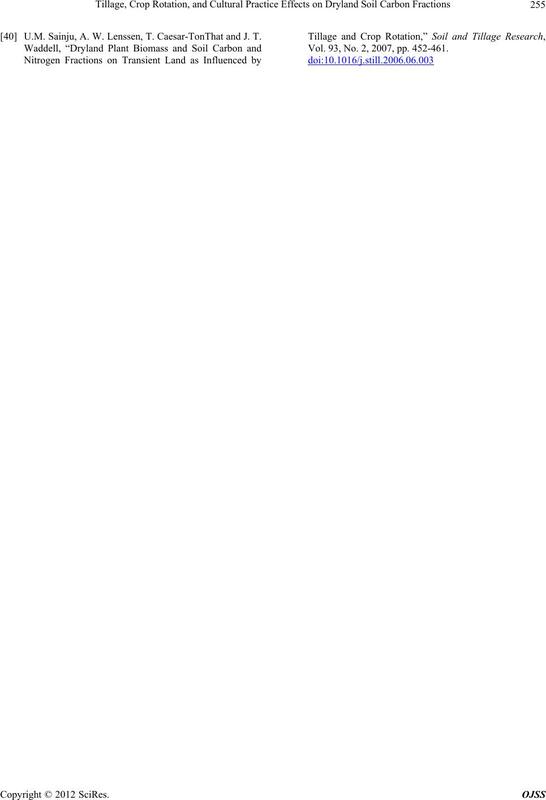 ***P ≤ 0.001; NS, Not significant. as a result of longer fallow period from delayed planting. deeper samples >10 cm are collected. are significantly different at P ≤ 0.05 by the least square means test; eSignificance levels: *P ≤ 0.05; **P ≤ 0.01; ***P ≤ 0.001; NS, Not significant. and 0 - 20 cm. than in other tillage and crop rotations in 2007 (Table 5). was greater in the regular than in ecological practice. depth in 2007 and 2008.
not significantly different among treatments in 2008.
more in the subsurface than in the surface soil. 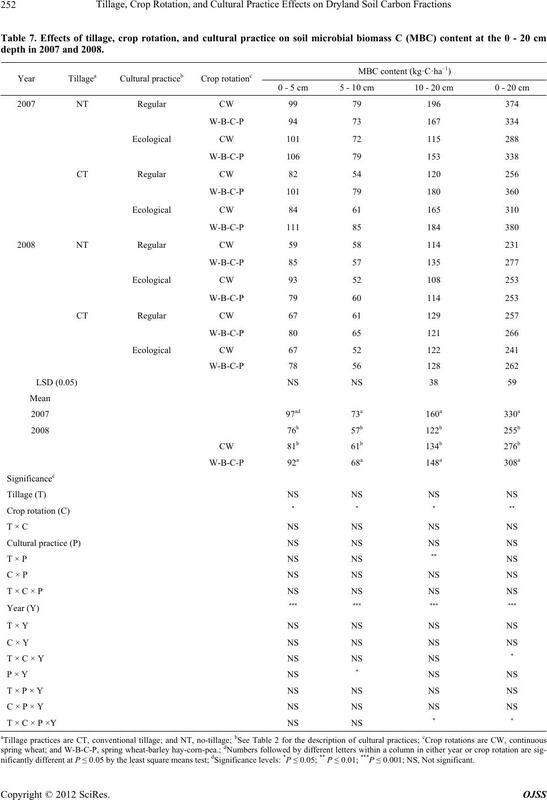 tural practice × year at 5 - 10, 10 - 20, and 0 - 20 cm. the regular practice than in CT with the regular practice. and POC were greater in this treatment (Tables 4 and 5). sulted in large changes in PCM level. in non-significant difference between treatments in 2008.
autumn 2007 to spring 2008.
due to increased crop residue returned to the soil. nificantly different at P ≤ 0.05 by the least square means test; dSignificance levels: *P ≤ 0.05; ** P ≤ 0.01; ***P ≤ 0.001; NS, Not significant. tions but occurred at all layers for labile C fractions. mineralization during the fallow period in the winter. 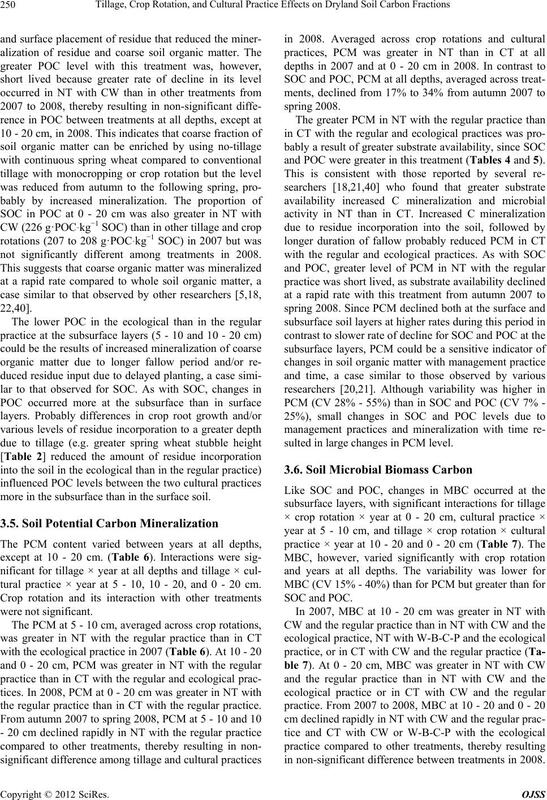 tions of C fractions under dryland cropping systems. herbicide and pesticide application, and harvest. 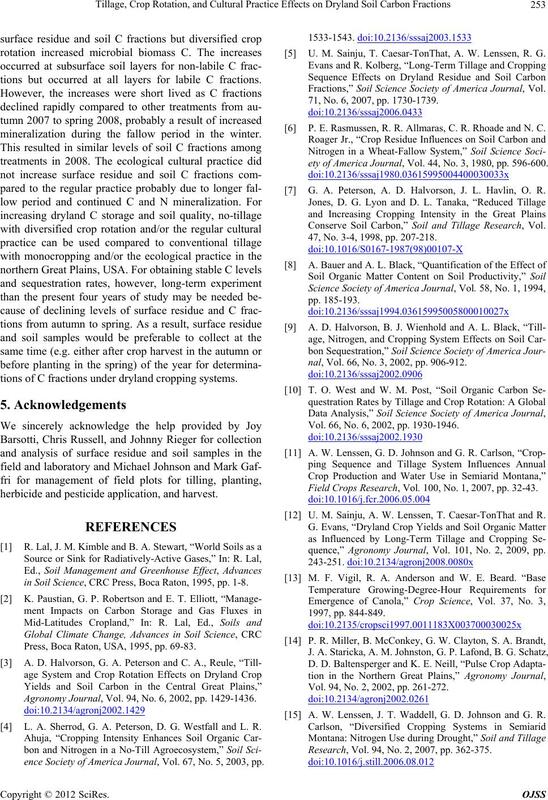 in Soil Science, CRC Press, Boca Raton, 1995, pp. 1-8. Press, Boca Raton, USA, 1995, pp. 69-83. Agronomy Journal, Vol. 94, No. 6, 2002, pp. 1429-1436. L. A. Sherrod, G. A. Peterson, D. G. Westfall and L. R.
ence Society of America Journal, Vol. 67, No. 5, 2003, pp. 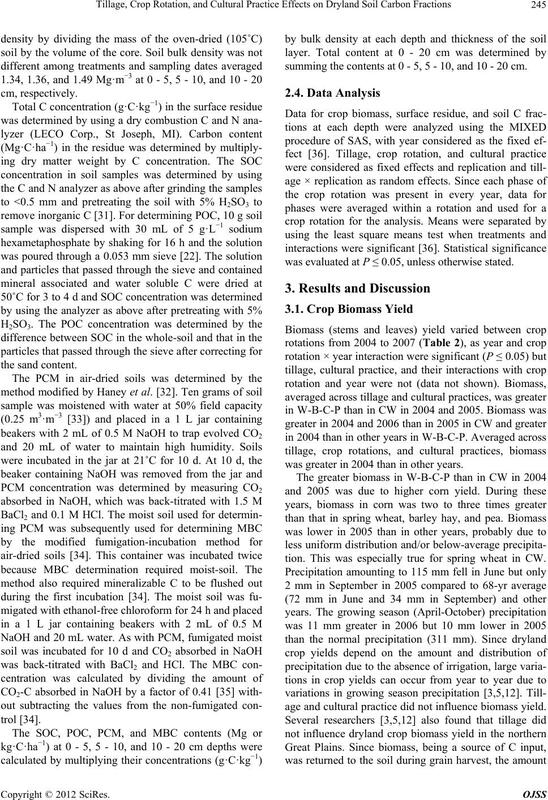 U. M. Sainju, T. Caesar-TonThat, A. W. Lenssen, R. G.
Fractions,” Soil Science Society of America Journal, Vol. 71, No. 6, 2007, pp. 1730-1739. P. E. Rasmussen, R. R. Allmaras, C. R. Rhoade and N. C.
ety of America Journal, Vol. 44, No. 3, 1980, pp. 596-600. 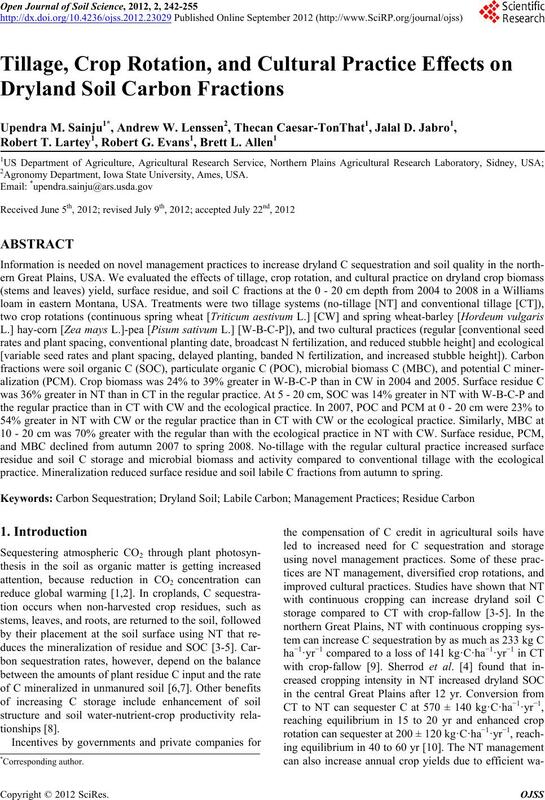 G. A. Peterson, A. D. Halvorson, J. L. Havlin, O. R.
Conserve Soil Carbon,” Soil and Tillage Research, Vol. 47, No. 3-4, 1998, pp. 207-218.
nal, Vol. 66, No. 3, 2002, pp. 906-912. Vol. 66, No. 6, 2002, pp. 1930-1946. Field Crops Research, Vol. 100, No. 1, 2007, pp. 32-43. U. M. Sainju, A. W. Lenssen, T. Caesar-TonThat and R.
quence,” Agronomy Journal, Vol. 101, No. 2, 2009, pp. Vol. 94, No. 2, 2002, pp. 261-272. A. W. Lenssen, J. T. Waddell, G. D. Johnson and G. R.
Research, Vol. 94, No. 2, 2007, pp. 362-375. Conservation, Vol. 51, No. 2, 1996, pp. 167-170. P. J. Gregory, J. S. I. Ingram, R. Anderson, R. A. Betts, V.
of America Journal, Vol. 59, No. 2, 1995, pp. 460-466. Science Society of America, Madison, 1996, pp. 1-18. P. G. Saffigna, D. S. Powlson, P. C. Brookes and G. A.
Australian Vertisol,” Soil Biology and Biochemistry, Vol. 21, No. 6, 1989, pp. 759-765.
nal, Vol. 56, No. 4, 1992, pp. 1155-1160. 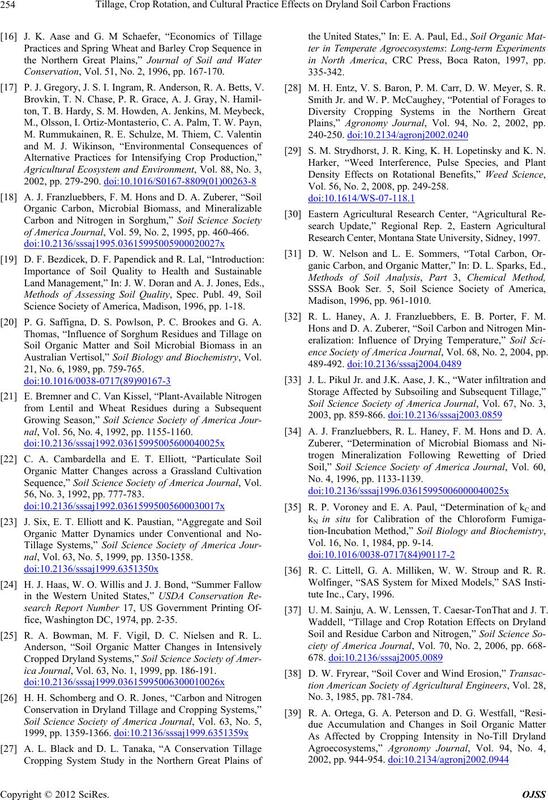 Sequence,” Soil Science Society of America Journal, Vol. 56, No. 3, 1992, pp. 777-783.
nal, Vol. 63, No. 5, 1999, pp. 1350-1358.
fice, Washington DC, 1974, pp. 2-35. R. A. Bowman, M. F. Vigil, D. C. Nielsen and R. L.
ica Journal, Vol. 63, No. 1, 1999, pp. 186-191.
in North America, CRC Press, Boca Raton, 1997, pp. M. H. Entz, V. S. Baron, P. M. Carr, D. W. Meyer, S. R.
Plains,” Agronomy Journal, Vol. 94, No. 2, 2002, pp. S. M. Strydhorst, J. R. King, K. H. Lopetinsky and K. N.
Vol. 56, No. 2, 2008, pp. 249-258. Research Center, Montana State University, Sidney, 1997. R. L. Haney, A. J. Franzluebbers, E. B. Porter, F. M.
ence Society of America Journal, Vol. 68, No. 2, 2004, pp. A. J. Franzluebbers, R. L. Haney, F. M. Hons and D. A. No. 4, 1996, pp. 1133-1139. Vol. 16, No. 1, 1984, pp. 9-14. R. C. Littell, G. A. Milliken, W. W. Stroup and R. R.
 U. M. Sainju, A. W. Lenssen, T. Caesar-TonThat and J. T.
No. 3, 1985, pp. 781-784. U.M. Sainju, A. W. Lenssen, T. Caesar-TonThat and J. T.
Vol. 93, No. 2, 2007, pp. 452-461.